Hi, we’re the Changs, and we’re here to teach you about the real value of your money: you. Our goal at Keeping Up With the Changs is to help people like you on the path to your financial independence. We want to empower you to take control of your money situation and define what financial freedom means to you so that money can bring you happiness. We want you to experience for yourself what it’s like to pursue the things that you care about without feeling guilt or stress, because you have funds to make the fun happen. You hear generic advice everywhere you turn: “spend less,” “save more,” “work hard to make more money.” But “good” advice doesn’t necessarily mean “right-for-me” advice. The key to being good with money is learning how to figure out your priorities in life and deciding on the trade-offs you’re willing to make for the here and now versus your future so you can live a life that’s satisfying throughout. We believe that everyone deserves to enjoy financial freedom & security, whether that’s simply making extra money on the side to pay for the things you want in full, or coming up with a full-fledged plan to achieve early retirement. Money is pretty black & white (actually, green & white), but humans aren’t. We don’t talk theory that takes emotion out of the equation, we focus on practical methods that work in real life. No matter what your financial situation, everyone should experience money wins. We share easy tips that will give you immediate results and complex ideas that challenge you to set your bar high (and achieve it). We don’t want to just tell people about how to improve their financial situation, we want them to actually do something about it. We show you how to put sound financial advice to good use. We are a multi-generational family that’s had a LOT of different money experiences, both good and bad. By sharing our story, others have the chance to try for similar successes and can avoid the mistakes we made along the way. We recognize that the choices we made in our lives aren’t necessarily ones that everyone would be on board with, but they have shaped a path to financial independence that we’re happy to be pursuing. We want to share our story because the underlying principle is the same: decide what is your priority, then do what it takes you to get there. Grandma & Grandpa Chang were FIRE’d before FIRE (financially independent & retired early) was a trendy thing. It wasn’t a walk in the park though. More like a marathon. In bad weather. With cramped muscles. From mile 1. They were born into comfortable lives in Vietnam, but war changed everything quickly. After going through some pretty crazy stuff to flee the country, they eventually were accepted into America as new immigrants. It was pretty scary, because they knew no English (except for Beatles lyrics) and had only $100 to their name. Heck, they couldn’t even tell a quarter from a penny! But they did what their generation does best: they sucked it up and learned to hustle. …among other fond memories. But through it all, they learned lots, made their comebacks, and ensured that success was not just limited to their generation by passing on their knowledge. Credentials: Graduated from the School of Hard Knocks with a PhD . They started life well off, and then war snatched it all away. They lived like the Joneses when they got here, but have since learned how to live it more happily their own way. Mama & Papa Chang are part of an awkward sandwich generation made complicated by an intersection between traditional Asian and modern American cultures. On one hand, they have an American-born Little Chang to raise, and are trying to strike a balance between not spoiling him yet also not letting him fall behind his peers. On the other hand, Mama & Papa Chang are trying to forge a strong foundation for their growing family while remaining responsible to their own parents, who did just the same for them in their childhood. Mama & Papa Chang worked together to make things happen: They’ve achieved a number of financial hurdles, including buying their own place. Their current bold dream: pay off their hefty mortgage in 15 years. As municipal workers with a fairly humble salary, their financial focus is on slashing spending, cranking up revenue streams, and getting that house debt out the door. Credentials: Graduated college at the perfect time: during a major recession and entering the low-paying government workforce with a humble salary made even smaller through mandated pay cuts to balance the government’s budget. Still managed to build their wealth and buy a place of their own in an area with an incredibly high cost of living. Many of Aunty Chang’s coworkers have a similar story of how they met her: She would roll right up, comment on how young they looked, and then immediately proceed to explain how they’d benefit if they started saving for retirement now while they were young and their money had time to grow. There are few things Aunty Chang loves more helping people achieve their own money wins (like that time she saved a friend from signing on a terrible mortgage that they could only actually afford if they ate ramen for 30 years straight). Her goal is to strive for financial independence so she can follow her many whims and passions. She has classes she wants to take, volunteer opportunities she wants to pursue, and other passions she’d love to work on on a regular basis. She and her husband choose to be a DINK household (dual income, no kids), so she plans to invest smartly and spend minimally to get to early retirement ASAP. Credentials: The one with the business degree (Accounting). But the real lessons were learned from being duped by shady people in an online venture and having a tenant so bad she had to evict them, but still choosing to dust herself off and try again. We are 100% American when it comes to our love of freedom. But money gets in the way of that when you can’t do what you want because you gotta work to pay for that kind of a lifestyle. That’s why financial independence matters to us, so we can find a means to fund our ideal lifestyle without being a slave to money and having to work forever for it. Our pursuit of financial freedom made our money “normal” drastically different than that of a typical American, and we want to teach you why and how we did it. Aspire to make financial independence a rule, not an exception. The average American household carries a monthly balance of $6929 on their credit cards (source). Plus, they stay longer in debt because of the interest that they’re paying on the balance. Pay off your entire balance every month to make sure the price you pay is only the amount you signed for on that credit card receipt. College students graduate and start their real adulthood deep in debt. In 2010, when Mama Chang graduated with her bachelor’s degree, her peers were already $25,250 in the red because of school (source). Unfortunately, that number has only grown, to over $37,000 in the present day (source). Don’t start out adulthood owing someone else thousands for your college education. That’s what Mama Chang did, and she had $40,000 to her name by the time she threw her cap in the air at graduation. Now that was something to celebrate. With monthly expenses for older couples averaging $3,800 (source), that money won’t even last 5 years into retirement. Start investing when you’re young. That’s what Aunty Chang did by socking away 50% of her paycheck into her 401k in the first three years of her employment. 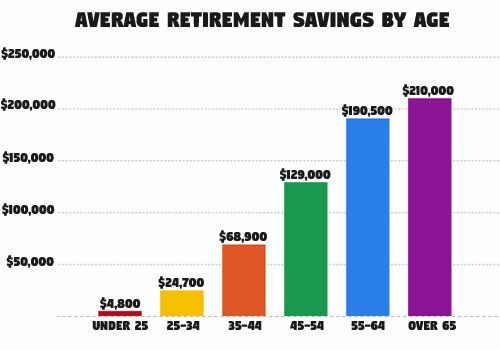 She saved almost as much as those at retirement age have while she was still in her 20’s. With time on her side to let her money grow, she can look forward to enjoying a comfortable (and early) retirement. By the time people are older, not working, and relying on passive income, they don’t have many streams of it. Future generations have it even worse, with no pensions to rely on and social security that’s less and less certain. Diversify your income sources early. Grandma & Grandpa Chang got right to this when they moved to Hawaii, which allowed them to retire in their 40’s with the confidence that they’ll still be okay if anything happened to one of those sources. They continue to build wealth while enjoying life in retirement with the passive income that exceeds their living expenses. It’s not your money that defines your financial well-being. You do. We’ll give you the stories and insights to inspire you, and the tools & tips to make it happen. Stay in the red or come over to the dark side? *Get access to the CHANG RESOURCE VAULT with free printables, handouts & worksheets to get your finances in order + subscribe to our newsletter.